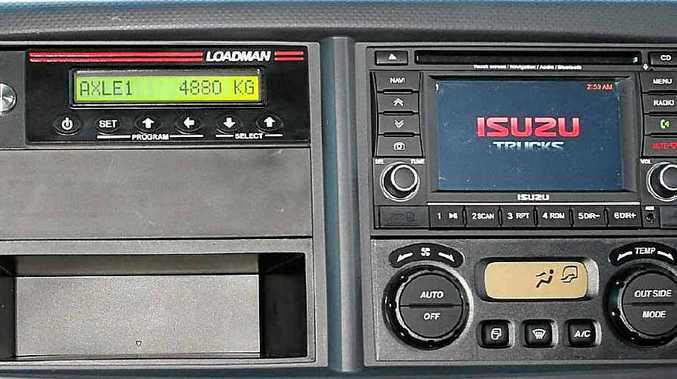 VERSATILE: The Loadman scales with DIN slot in-dash display. LOADMAN Australia is a specialist provider of on-board scale systems for trucks and equipment and has recently deployed new technology solutions to meet new demand in operator requirements. The Loadman LM200 meter which is the current display solution for Loadman on-board scale systems comes with some unique capabilities. Options include Bluetooth, 3G phone modem and two RS232 data outputs as well as GPS capability from a single device. The meter is also now offered with a newly designed DIN slot housing for in-dash flush mounting. The Bluetooth capability enables hand-held remote display options including an Android Smart phone app and PDA type devices. This capability enables operators to check scale weights from outside the cabin. The Bluetooth or 3G communication options enable data to be downloaded to Loadman Fleet Management Software. RS232 data output is used for an on-board printer option and as a data link to compatible GPS fleet management systems. Having dual RS232 outputs enables simultaneous printer and data transfer capability. Soon to be released is the Loadman LM400 touch screen display; a device that will provide all the capabilities of the LM200 meter with graphics. Developed for the Loadman front load refuse scale application it is adaptable to suspension and load cell-based systems. All axle groups are featured on one display with identification for trailers. Operators can select and confirm configuration, applicable customers and location information. While hi-tech systems suit some operators Loadman still offers digital scale solutions for many applications with sourcing from three manufacturers enabling a system designed to fit most requirements. From a simple-to-operate Airtec chassis-mounted axle load indicator for individual axle groups, through to the transportable multi-application truck PC, Loadman has all the systems.